On the 13th of August, the South Australian Variety Bash arrived in town to camp overnight on Bear’s oval (we renamed the town footy field, although the locals call it the Sahara). 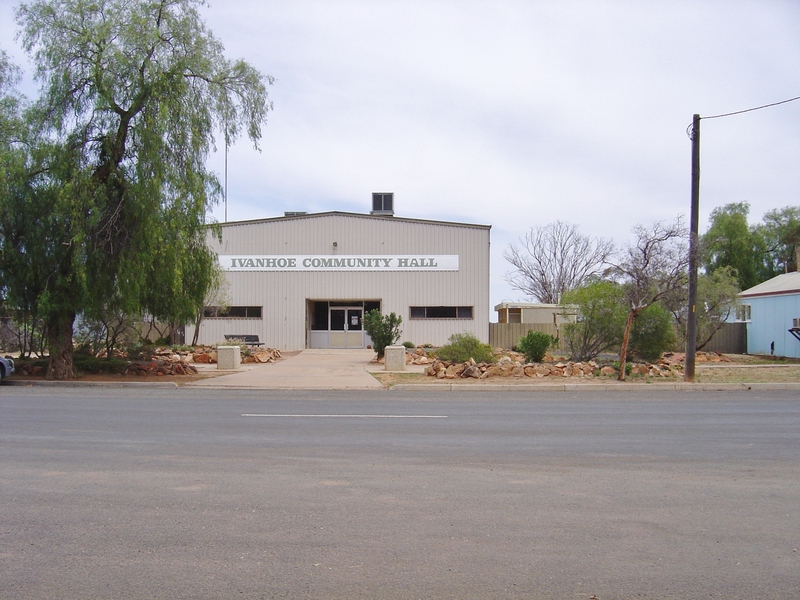 The Ivanhoe Campdraft Committee had been tasked to provide a three course dinner at the Community Hall and I had volunteered to help out with serving up baked vegies to 350 cold and hungry travelers. It was a fun night with lots of people in fancy dress costumes ……. a couple of Borats, the 3 little pigs, Red and the Wolf, the Incredibles, Batman etc ………..all in their respective Batmobiles / Ice cream trucks etc. For me, the highlight was getting to hear Todd Russell, (who was on the Bash) talking about his experiences underground, in the Beaconsfield mining disaster. The town’s population quadrupled for a day. The next day we had a visit from the Police minister, David Campbell, who was doing a tour of remote outback police stations for his new portfolio. He was shown around the police station and the residences before we went to lunch at the RSL club. When David asked how things were going Nigel was quite vocal about the need for an air conditioner, shared phone lines that worked and the septic system, which needs fixing. If you don’t ask you don’t receive. Outdoors, I’ve been busy trying to get the yard to look like a garden, rather than a scene out of Mad Max (Remembering that the film’s location was Silverton – just ‘up the road’). It’s very dusty and there’s a hose attached to one of the septic tanks, which is supposed to spray clean grey water on the yard at regular intervals. But the ‘clean’ grey water is actually quite smelly and contaminated so we need someone to come in and add things to the septic tank that will balance the bacterial level ……………… or something like that:-) It’s a typical rental problem where there are new tenants every two and a half years but no one passes on instructions about how to service the septic system so it ends up getting neglected and, eventually, very smelly. 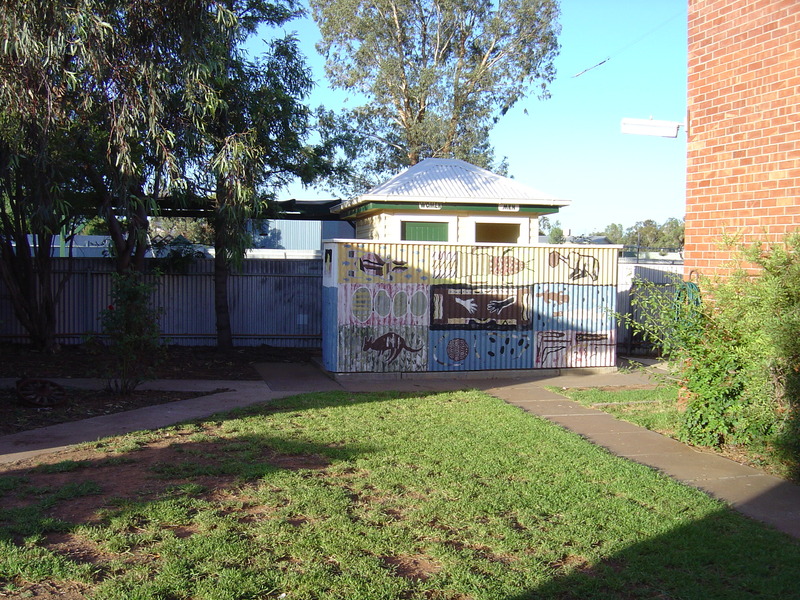 I’ve also dug up a couple of tonnes of dirt – an apparent sandpit was actually just a lot of dirt and weeds covering a paved area under the pergola (which is surprisingly situated immediately behind the police station toilet block). The area came up quite well after I put in a garden either end (Gazanias and Pig Face stolen from the police station) and I’ve also bought drought-proof plants on Ebay ( Yes, Ebay!! ………and I thought it was all over!!) to put in gardens that I’ve created using railway sleepers.. The other day we ordered some meat from the Hillston butcher – at 150 kms he’s our closest butcher: a side of lamb and a hindquarter of beef (56.5 kg), as well as eggs, bacon and lots of bones and chicken wings for the Bear. $630 later and Mick, the publican picked it up in his ute for us while getting his grog order. 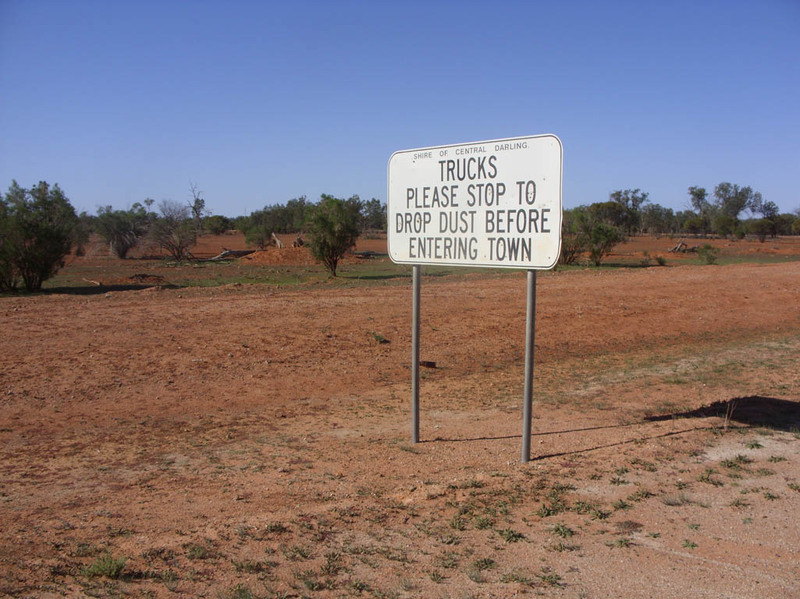 People are very neighbourly in the outback. The beef came with 4 corned pieces and who knew, after 20 years, that Nigel loved hot corned beef? So with (sister) Jan’s recipe, I’ve been cooking up corned beef and it mostly gets eaten hot before it makes it to sandwiches. There’s no sign of a casual teaching number yet but I’ve had a work offer from the Governor of Warakirri Correctional Centre, which is situated just opposite Ivanhoe Station. It seems that when State Rail pulled out of Ivanhoe in the 80s, a gaol was built and the previous staffing quarters were taken over by Corrective Services. He is trying to get approval for me as a temporary appointment at the gaol, working in literacy and numeracy but it’s a bit tricky because they really need 2 full-time permanent teachers and no one seems to want to make the move to sunny Ivanhoe. I only want 2 or 3 days maximum per week and, understandably, the education officer isn’t all that happy about giving up a permanent position for a temporary part-time position because once you give up the funding, it’s pretty hard to get it back. So the Governor is facing a bit of resistance over the appointment and, to be honest, I’m not actually positive that walking around the classroom with a walkie-talkie (for safety) is actually the way I’d like to teach. I guess we’ll see…….. Yesterday we had a visit from a plumber and it seems that at last the yard will be dug up and our 4 septic tanks (apparently we were housing the tanks for the police station and the other residence, as well as for our own residence) will be replaced by one tank. The Police Minister was obviously genuinely interested when he asked about the conditions. So my hours of digging, shoveling and planting lawn seed were all in vain because the backyard is about to be dug up and apparently not a blade of grass will remain! Speaking of being too organised, it seems we also jumped the gun with our broadband connection, which we had installed on the police “back line” (who knew!!) and which now needs to be ‘removed’. Apparently for the last month the Police Force has been unwittingly paying our phone bill. This was only discovered when the Police Minister went back to Broken Hill and brought up Nigel’s complaints about the phone system. In our defence, this isn’t entirely our fault because the information we needed, which explained how the phone and electricity accounts worked (I wonder who’s paying our electricity bills) is all contained in an Induction Package, which Nigel and Jackson were due to receive when they went to Broken Hill for an Induction (Yes, surprisingly the ‘Welcome to Ivanhoe’ induction ceremony was to take place 350 kms away in Broken Hill). But plans went awry when the boys were needed to help out with a search warrant and no such induction took place. So yesterday, when a Police Communications officer rang the police station and got me instead it became obvious that we needed our own phone line. To cut a long story short, after many hours on the (police) phone to a certain Telco, we’ve gone from a broadband connection on the police line …………………… to an appointment for another technician to come back (800 kms round trip) and put in a new line……………… to a new appointment for a technician to reconnect the existing line because there was a separate line under the house (which no one had noticed because they were probably too busy looking out for brown snakes) to ‘Why do we need a technician? Why not just flick the switch? And that’s exactly what is due to happen this morning between 8am and noon. Hopefully this will be the last time that we’ll need to connect the phone (Total cost so far $418). So there you have it. It really doesn’t pay to be super–organised because plans get changed daily and sometimes hourly! Update: Today we had another technician come out because the new / reactivated phone line didn’t work (we really should have seen that coming). So we finally have our own line and a new (legal) phone number. Now we just have to wait till next Tuesday for our broadband service to be swapped to the new number so that I can actually send this email. Reads really,really well. Are you a professional writer? We need to see some more. We really do. Thank you so much please keep them coming.